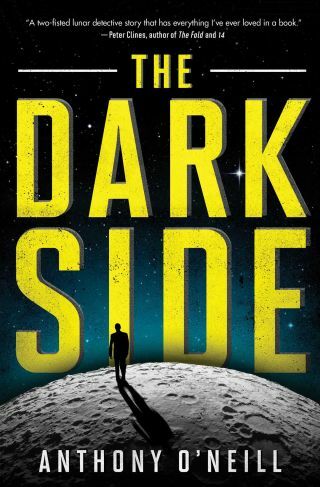 "The Dark Side," by Anthony O'Neill, is a detective/horror novel set on a lunar colony. A new novel follows a detective assigned to a seedy colony on the moon's far side, called Purgatory, as a murderous android prowls the dusty, deadly lunar surface. Anthony O'Neill, author of "The Dark Side" (Simon & Schuster, 2016), has written four previous books, mainly historical fiction that places a narrative in a distinct time and locale. For this book, he chose a more futuristic target: a colonized moon. Space.com previously published a Q&A with O'Neill where he discussed the moon as a setting, a (fictional) aerospace billionaire villain and the potential for humans on the moon. Read Chapter 1 of "The Dark Side" below. The Moon is a dead rock — eighty-one quintillion tons of dead rock. It’s been dead for nearly four billion years. And — inasmuch as a dead rock wants anything — it wants you dead too. So you can go quickly. A landslide can bury you. A lava tube can collapse on you. You can plunge headlong into a crater. A meteoroid can strike your habitat at seventy thousand kilometers per hour. A micrometeorite can bust open your spacesuit. A sudden burst of static electricity can blow you apart in an airlock. A slip, a cut, a ruptured seal, a faulty oxygen tank can kill you in minutes. Or you can go a little slower. A wiring malfunction can shut down air filters. A corrupted computer program can play havoc with climate-control systems. A particularly nasty pathogen — mutant strains of bacteria flourish in enclosed environments — can kill you in days. If you’re out on the surface, the sudden temperature plunge between sunlight and shade can leave you with thermal shock. A solar flare can toast you like a TV dinner. A vehicular breakdown can leave you suffocating in your spacesuit. Or you can go incrementally, over the course of years. Moondust can work its way like asbestos into the deepest fissures of your lungs. Prolonged exposure to chemical vapors and gas leaks can wreck your whole respiratory system. Reduced gravity — one-sixth that of Earth — can fatally weaken your heart. Cosmic radiation — galactic rays from dead suns and black holes — can warp your cells. Not to mention a cocktail of psychological factors — sensory deprivation, insomnia, paranoia, claustrophobia, loneliness, hallucinations — that can reshuffle your mind like a deck of cards. On the Moon, in short, you can be killed by the environment. You can be killed by accident. Or you can kill yourself. And then of course you can always be murdered. By gangsters. By terrorists. By psychopaths. By ideologues. Or simply because you cost too much to keep alive. Only a lunatic — or a renegade, or a pariah, or a misanthrope, or a risk junkie, or a mass murderer — would live permanently on the Moon.